The team in Zambia operates from Lusaka. 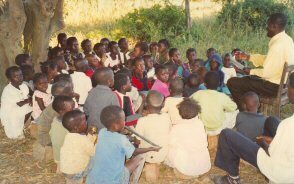 They have precious opportunities to reach out to children by means of regular Bible Clubs in the area. On occasion they also hold evangelistic outreaches when invited by churches for this purpose. They wish to expand further into rural areas, but it is not always possible – please pray for wisdom and opportunities. The country was declared a Christian country. Please pray that it will stay that way and that the doors will remain wide open for the Gospel.